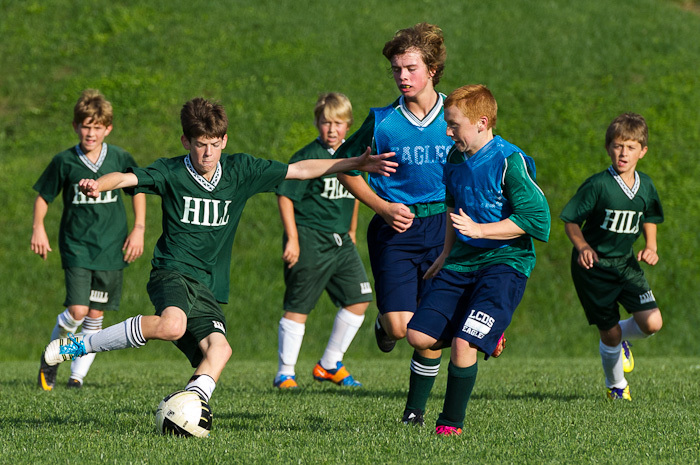 The Hill School varsity soccer team is composed of five sixth-graders, which I’ve discovered isn’t all that common among other schools. Today the team faced Loudoun Country Day School, and you could really see a huge difference in size between the two teams. Most of the LCDS players towered over Cameron and his classmates, but it didn’t seem to faze them. They really dug in and tried their best to move that ball to the opposing goal. In the end, LCDS prevailed by a score of 3-0. Cam was disappointed, but I just reminded him that in two more years, when he’s an eighth-grader and weighs more than 100 pounds (hopefully! ), he’ll be the one the younger kids will be chasing after.